The work-list of Salomone (or Salamone) Rossi in New Grove looks pretty ordinary. It includes eight books of madrigals and four collections of instrumental pieces. That is not any different from what many of his colleagues composed and published. The only difference is the music which is mentioned under the header ‘sacred vocal’. Here we expect to see masses, motets, sacred concertos or music for Vespers. However, we find here a collection of pieces with a title in Hebrew, Hashirim asher lish’lomo, ‘Songs of Solomon’. Rossi was one of the very few Jewish professional musicians of the baroque era who was able to explore his talents as a composer. In most countries in Europe many restrictions were imposed upon the Jewish communities which were often living in ghettos. That wasn’t any different in Mantua. It was due to his close connections to the court of the Gonzagas in this town, where he was born and died, that Rossi was given the privilege of going outside the ghetto without having to wear a yellow star. He got experience as a singer and violinist under Monteverdi, who worked in Mantua from 1590 to 1612. The good relationship with the Gonzagas is also reflected by the fact that several of Rossi’s publications were dedicated to members of the court: both his book of canzonettas (1589) and the first book with five-part madrigals (1600) were dedicated to Duke Vincenzo of Gonzaga. Rossi’s sister also took profit from this connection as she served the court as a singer - known as ‘Madama Europa’ -, making her the only professional Jewish singer of her time. She sang the title role in Monteverdi's now lost opera Arianna. The present disc, which was first released in 2008, includes music from both ends of the stylistic spectrum, so to speak. 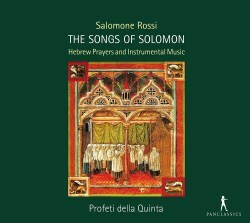 The Songs of Solomon are rather conservative, written in the stile antico of the 16th century. That can be explained by the conservatism in liturgical matters of the Jewish community. It was forbidden to use instruments in the synagogue; that prevented Rossi’s including instrumental parts or even a basso continuo in his Songs of Solomon. The very fact that he was allowed to write polyphonic music was already a deviation from the tradition of ages. The ecclesiastical authorities in the Catholic Church largely considered the modern concertato style inappropriate for liturgical music as they associated it with opera. The views in the Jewish community were probably not very different. This explains why Rossi turned to the safe tradition of the past. The title Songs of Solomon should not be taken too literally. The texts were not written by King Solomon: the selection recorded here includes Psalm 8, written by Solomon's father David, and verses from Psalm 80, whose author is Asaph, “chief musician”, as the King James Bible calls him. There are also some prayers, including a so-called kedusha, and a wedding ode (Lemí echpótz). The programme ends with a kaddish, a song of praise. The title Song of Solomon refers, rather, to the first hymns which were sung in the temple which was erected by Solomon. It is also plausible that the title refers to Rossi's own first name. Considering that instruments were not allowed in the synagogue it is a bit odd that two of the pieces are performed here with the participation of instruments. One probably could argue that these songs were not only sung in the synagogue, but also in private homes. However, in that case the participation of a cornett is debatable as this was probably mostly used in larger spaces. This is the only little blot on marvellous performances by the singers of Profeti della Quinta. Although, these pieces may be rather conservative, there are some influences of contemporary music, for instance with regard to text expression, and these aspects are not lost on the interpreters. The wedding ode already mentioned, is especially notable for the application of echo technique, often used in opera. The text is sung by a soloist, and the last syllables of every phrase are repeated by the ‘chorus’. The other part of this disc represents the modern side of Rossi's oeuvre. His instrumental music was published in four editions between 1607 and 1622. They show the stylistic development from music related to dance to virtuosic pieces for two treble instruments and bc. Many pieces have titles which refer to bass patterns popular at the time (e.g. Sonata quarta sopra l'aria di Ruggiero) or to melodies which are varied and embellished in the style of diminutions. The sinfonias probably refer to the practice of including instrumental pieces in secular vocal music, either as introduction or as ritornellos between sections. These instrumental works were intended for violins in the first place, as the title pages prove. Here they are shared between the violin and either recorder or cornett. That seems a fully legitimate option: as long as the instrumental parts don’t include techniques which only the violin can handle - such as double stopping - there is no reason to exclude other instruments. The instrumentalists deliver colourful and dynamic performances. The latter is especially important: a lack of dynamic differentiation results in dull performances which are devoid of what makes this music different from what was written in the previous century. They also add embellishments, according to common practice at the time.